By now, you know about Mr. Jobs stepping down as CEO of Apple. Perhaps the new CEO, Tim Cook, might want to look into these EscapeCapsules. Okay, that sounded weird. I’m not implying that Mr. Cook needs to escape in any way from his new position at Apple. The EscapeCapsule isn’t something that one uses to quickly leave, but it is something to protect the iPhone 4. Right now, Catalyst has put their Escape Capsule on Kickstarter, but it really should be an official Apple accessory as it is downright useful for protecting an Apple asset. What you are seeing here is an exo-skeleton made from high-impact clear polycarbonate, which can protect against the elements, including water. It also can protect against impacts like scratches, and while I don’t have the exact specs, it will go underwater. The EscapeCapsule protects the hardware buttons, as well as the touchscreen. 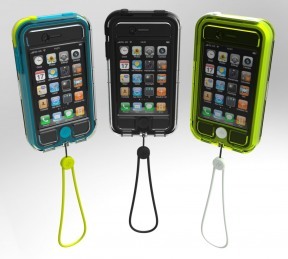 It also comes in a variety of colors and has glow-in-the-dark rubber bumper and lanyard. I’ve seen a lot of iPhone protecting accessories before, and this one looks very, very good. If you pledge $50, you can pre-order the EscapeCapsule now. Catalyst intends to sell the case for $70 when it hits the market, so that is a pretty good deal. Just got mine today. Looks cool but can’t hear calls , problems pushing letters on sides of phone & have to remove from case to charge the phone, which takes a lot of effort. This far not impressed with customer service. Tried to talk on phone & could not be heard. Manufacture claims about the sound were false. Will send back for refund immediately if I can ever get anyone to tell me how. No info abt returns on site that i can find. No responses to multiple emails i sent regarding shipping in past two weeks, so not really thinking I’ll get a response to most recent request for return info. Way too expensive as well. I consider this case a really cool looking total fail. I pretty much hate it & I’ve had it for about 4 hours now. My previous case was an Otterbox, which I don’t much care for so far as durability & looks go, but at least i could 1. Easily use 100% of my keyboard 2. Actually use it as a phone 3. Use the side button to turn off ringer (cannot w/ catalyst case) 4. Charge the phone without removing the case. I really wonder what the designers of this case were high on when they made it. Too many issues & for $90 bucks, I expect the case to be darn near perfect. This one isn’t eleven tolerable. Don’t buy.